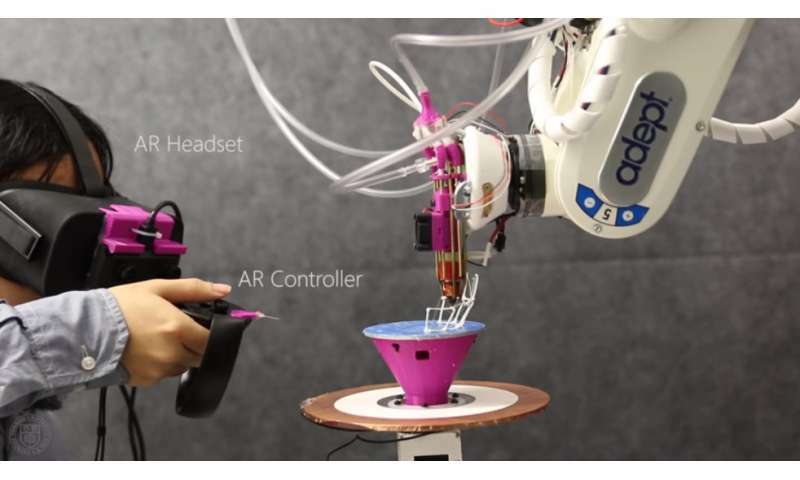 Cornell researchers are taking 3-D printing and 3-D modeling to a new level by using augmented reality (AR) to allow designers to design in physical space while a robotic arm rapidly prints the work. "Instead of designing 3-D models on the computer screen, we wanted to give users the opportunity to work in conjunction with the robot. We call it in-situ fabrication," said Huaishu Peng, Cornell information science doctoral student. To use the Robotic Modeling Assistant (RoMA), a designer wears an AR headset with hand controllers. As soon as a design feature is completed, the robotic arm prints the new feature. "The cool thing is that the robot can print the users' design at the same time and place. The designer has this tangible feedback early in the design phase and can make adjustments," said Peng. "The combination of AR and robot allows the designer to use the just-printed part to design their next features. The designer can even directly design and print on an existing physical object. This tightens the process between design and fabrication." The researchers have developed an interactive technique that allows the robot and the designer to work together – knowing to print in the back of the object if the designer is working in the front and also automatically re-computing the changes being made in real time. "In the future, we expect a robotic arm can be an intelligent design assistant," said Peng. "There is a very promising future for the combination of augmented reality and 3-D printing – for example, for making furniture and other fast printed physical items in a real environment." Peng and his collaborators – computer science master's student Jimmy Briggs; computer science doctoral student Cheng-Yao Wang; Francois Guimbretiere, professor of information science; Joseph Kider, Universitiy of Central Florida; Stefanie Mueller, Massachusetts Institute of Technology; and Patrick Baudisch, Hasso Plattner Institute, Germany – will present their paper on RoMA at the Human Computer Interaction conference in April.